LAS VEGAS – The WON BASS US Open is one of the most hallowed bass-fishing events in the world. And now, as the 36th Annual US Open on Lake Mead, Nevada approaches, anglers competing for the Open title have another major award to shoot for: $50,000. 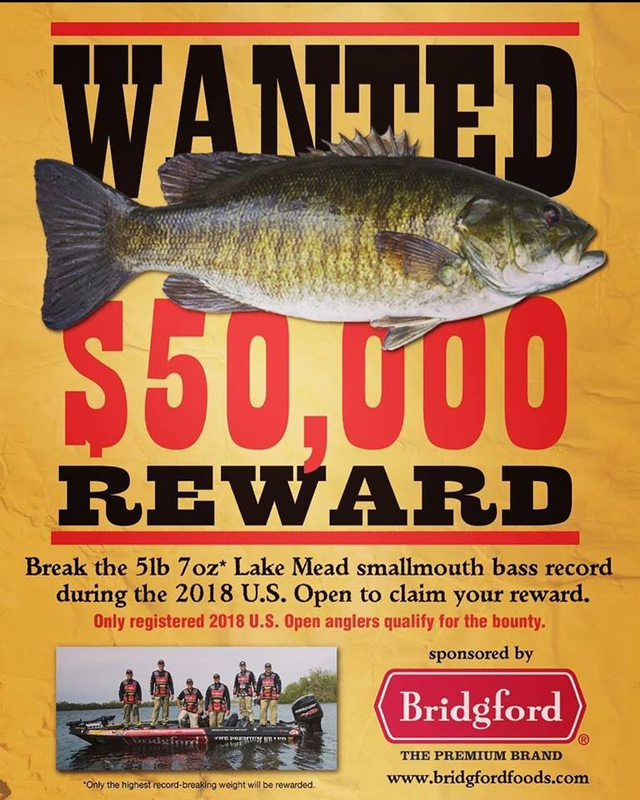 Bridgford Foods, a longtime sponsor of the US Open, is offering $50,000 to the officially registered US Open competitor who breaks the Lake Mead smallmouth record – 5 pounds, 7 ounces – during official Open competition days (Oct. 15, 16 & 17). And according to the tournament's longtime director, Billy Egan, that record fish is almost definitely swimming around in Lake Mead. "(The record smallmouth) was already caught four months ago," Egan says. "The guy who caught it didn't know it was a record, but there are photos of a fish that's bigger than 5-7. That 'unicorn' fish is pysically in that lake." The Lake Mead smallmouth fishery historically produces multiple fish every year in the 4-plus-pound range, and even though 5-pounders are infrequent, Egan believes that Open competitors have a realistic shot at claiming the $50,000 bounty. "That record is not out of range," he asserts. "There are a million fish in that lake, and it's hard to say how many fish in that 5-pound range there are, but it could definitely happen."